With the next-generation Nissan Leaf electric car launching at the beginning of September the manufacturer is starting to reveal some of its key features, with the latest being an 'e-Pedal' that can act as both accelerator and brake. Nissan believes this revolutionary technology will transform the way we drive. While the Leaf will feature a traditional brake pedal, a flip of a switch will see the Leaf's accelerator turn into an e-Pedal, allowing drivers to both accelerate, decelerate and stop using just the e-Pedal. 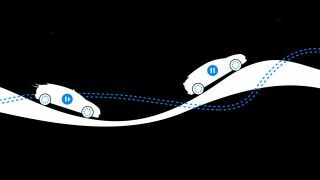 Nissan believes that the e-Pedal/accelerator will cover 90% of the driver's needs. You'll press the e-Pedal to accelerate as normal, but when you want to slow down you'll simply take your foot off the pedal and the car will automatically reduce in speed, coming to a complete stop should you want it to. The mechanism is even strong enough to hold the car on a hill. For sudden braking situations you'll still need to jam the brake on with your foot, while switching the system off will see the car's pedals behave as normal; but when you're in town or stuck in traffic, the one pedal should be all you need. Previously to the announcement of the e-Pedal, Nissan has also released images of the new Leaf's headlight cluster, which suggests a more angular design than the curved features of the current model.